This month I’m celebrating my twentieth wedding anniversary with architecture (June 9, 1990). Like most relationships we have our ups and downs – good times and bad times, sickness and health. Every time I think about walking away from her, I follow my heart and honor my commitment…the fact is I love her – and I always will. When people ask me “What made you want to become an architect?” the long version of my explanation is a bit complicated. To be honest, I had no idea what the profession entailed prior to getting serious about choosing my major (junior in high school). This is a disturbing reoccurring theme amongst “disadvantaged/minority” youths across the nation – an overall lack of awareness and exposure when it comes to the design professions. I was reminded of this painful truth just a few weeks ago when I participated in a career day at a local high school where the racial demographic was approximately 60% Latino, 35% African-American, and 5% caucasian. Amongst all of the students I spoke with that day (approximately 50 freshman), 95% of them had no clue what an architect is or does – and frankly, showed very little interest in learning more. They all seemed rather put off by five years of college, three years of apprenticeship, and a $34k starting salary. It’s funny to me because I’m sitting in front of these kids as an advocate for hard work and dedication to the profession and they are looking at me as if I’m totally nuts – I actually started to question my own motives…maybe I am nuts. Why did I choose this profession? I chose the architectural profession because I was born with a pencil in my hand so to speak. I’ve always had a magnetism toward visual expression of my thoughts and ideas – however I was accustomed to channeling my talents toward fine art and illustration. In high school I won a regional NAACP ACT-SO award for painting (http://www.naacp.org/programs/act-so/), which led to a several commissions as an illustrator for a greeting card company; at 16 years old I thought I had it all figured out. During a family gathering 24 years ago my older cousin Vicky asked me what I wanted to be when I grow up, I told her that I planned to be an artist. She responded by informing me that if I wanted to secure “gainful employment”, the architectural profession would be a much wiser pursuit (there’s actually irony in this advice – but we’ll address that later). So I did a little research on architecture, then submitted applications to several universities and was accepted by the California Polytechnic University, Pomona School of Environmental Design. I remember it like it was yesterday, one Saturday afternoon a woman by the name of Alice Blue Lee representing Cal Poly’s Minority Outreach Program called my parent’s home and asked to speak to me. She said that although there was an overwhelming demand for entry into the school of architecture (at that time one of the top architectural programs in the state), she had two positions that were to be filled by “disadvantaged” applicants. She called to offer me one of the slots on one condition: “Jonathan, you have to promise me that you will work hard and become a graduate of this program…Do I have your word?” (kinda reminiscent of the scene from the Bourne Ultimatum). Fast forward twenty years, there are two things that are certain: Yes, I am a product of “affirmative action”…and yes, I kept my promise to Alice Blue Lee…plus some. So, when did I fall in love with architecture? My infatuation with architecture began in 1990 as a freshman in design school on a trip to the Louis Kahn designed Salk Institute in La Jolla, California. 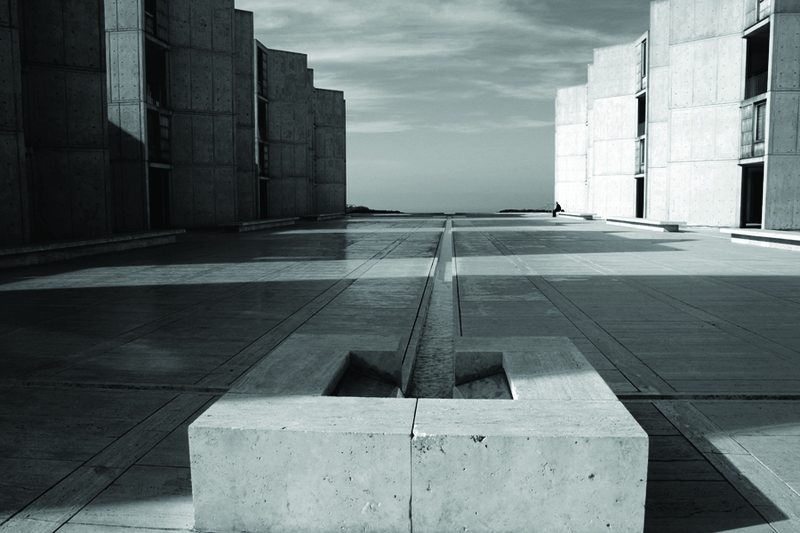 While standing in the main view corridor watching the concrete plaza disappear into the horizon, it was then that I first realized the impact of the built environment on human emotion – if you haven’t been to the Salk Institute and experienced the view in person (shown above on the left), I guarantee it will change your life. 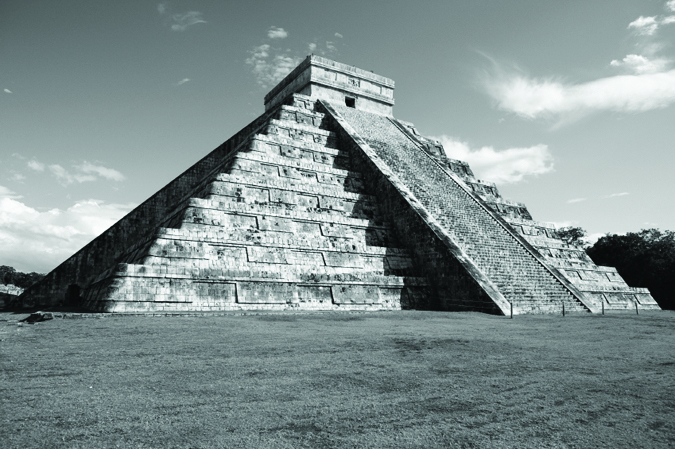 I fell in love with architecture in 1993 as a junior in design school on a trip to the Yucatán Peninsula to see the pyramids of Chichen Itza (shown above in the middle). It was then that I began to understand that the world is larger than my immediate surroundings. I realized that the built environment should do more than just cater to our daily needs; it is in fact a part of our cultural and spiritual expression – in many ways it contributes to the definition of who we are and confirms that there is more to us than just “us”. I “popped the question” so to speak in 2003 when I traveled to Barcelona, Spain and stood at the base of Gaudi’s Sagrada Familia. I got off the train walked out the station and I remember telling my wife – “I don’t care what we do while we are here but we have to see the Sagrada Familia”. I had no clue where it was or how I would find it, then I turned my head and there it was! I was awe struck by this incredible masonry structure that resembles melting candles (shown above on the right). Take a second to give this a little thought; how did Gaudi pull that level of craftsmanship off way back then when in contrast to today (in the age of Avatar for goodness sakes), we can’t get a contractor to build a traditional one story parking garage with simple stick framed construction above without melting down the entire project budget? 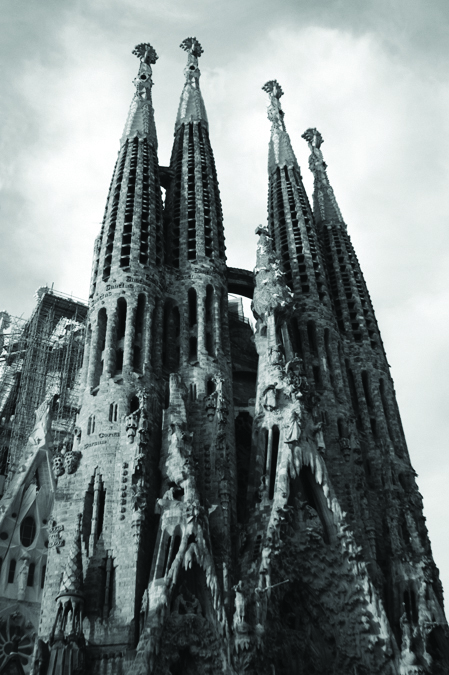 Seeing The Sagrada Familia in person was my moment of clarity, the point in time that I knew what I would do and what I would be – I was hooked. The Month of May is special for Pendulum Studio – my business partner and I decided to hang our own shingle on May 18, 2007 (Incorporation Day), My wife and I tied the knot May 30, 1998, we’ll move into our new office space May 2011. As we continue to reach new milestones in our careers it only seems appropriate to launch our blog in our favorite month of the year. We’ll save random thoughts for our twitter posts and instead “break ice” with dialogue centered around issues we encounter while practicing architecture during troubled economic times – the good, the bad, and the ugly. It’s been reported that there are over 400 unemployed architects in the Kansas City metro alone and the numbers are climbing. Firms that have been considered household names for the past 25 years (affectionately referred to as the 800 pound gorillas) have started to bleed – there’s just not enough bananas to go around. Principal Owner’s of these firms are adopting guerilla warfare tactics just to stay alive. The “client pool” is becoming harder and harder to secure on the long term – fueled by the desperation of the profession. The “client pool” treats “us” (architects in general) as second class citizens because guess what…”if we don’t like it, there’s always another architect out there willing to do the work and live to die another day” – which says something about “us” (yet another topic for discussion). As my business partner often says – “It’s tough out there”, yet we are still aggressively optimistic. We are living in the era of the “market challenger” – it’s time for us to be smarter, faster and more agile while conducting better business in general. It’s time for all of “us” to ingest a healthy dose of “get right” (as my father often says), and bring value back to this devalued profession. Author PendulumPosted on May 30, 2010 June 13, 2010 Categories What's New TodayTags Anniversary, Architecture, Gorilla, Pendulum, StudioLeave a comment on Hello world!